Written by: Priya Potapragada on April 2, 2018. Located in one of the most remote regions, nestled in the tallest mountain range in the world, the himalayan state of Nepal is home to nearly 27 million people. Over 80% of the population lives in isolated & rural areas which is particularly troublesome for a country prone to natural disasters such as landslides, earthquakes, and flooding. In such remote areas, it is common for access to healthcare to be virtually nonexistent or, at the very best, lacking adequate resources. One of the most immediate threats to health in Nepal, a country with an abnormally high prevalence of disease, is Rheumatic and Ischemic heart disease (RHD & IHD), which often stems from untreated infections such as strep throat and scarlet fever. Established in 1988, The Nepal Heart Foundation (NHF), is an NGO operating out of Patan city in central Nepal that “aims to ensure a better life, free of heart disease, in Nepal”. The foundation provides screenings, follow-ups, and medical procedures for at-risk communities throughout the country. Since the 2015 Gorkha earthquake, NHF has provided heart screening for over 50,000 students in Nepal. Using funds granted through CAF America, NHF was able to provide 16 medical professionals and 127 community health workers with special training in identifying heart problems. Workers were trained not only to treat existing problems, but also how to identify early signs of RHD & IHD in young people. 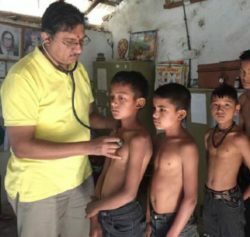 The medical team dispersed through several Nepalese districts including Dadeldhura, Rasuwa, and Sarlahi and more than 10,000 students from 42 different schools received screenings by the NHF medical team. Over 1,000 students who were suspected of having heart defects have gone through additional tests to rule out valvular and congenital heart problems. 19 students and 4 adults underwent treatment, including surgery. To raise and sustain awareness of congenital heart disease, NHF produces and distributes public educational materials including radio jingles aired on local FM radio and video PSAs. The Foundation maintains a register of those diagnosed with RHD or IHD and ensures that Penicillin is readily available in 26 districts of Nepal.